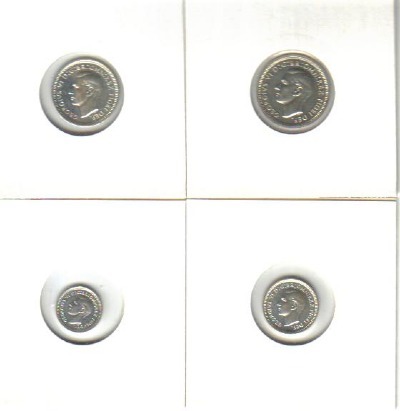 Maundy coins cosist of a 1d, 2d, 3d and 4d. The Maundy coins are detailed below. The size and design of the coins and also the reverse have not changed since 1822. 1 penny ---- Weight 0.5 grams. Diameter 11 millimetres. 2 pence ---- Weight 0.9 grams. Diameter 13 millimetres. 3 pence ---- Weight 1.4 grams. Diameter 16 millimetres. 4 pence ---- Weight 1.9 grams. Diameter 18 millimetres. The original coins were 0.925 silver. The fineness was reduced to 0.500 in 1921. Then in 1947 all silver was removed from everyday coinage. Cupronical was then used. 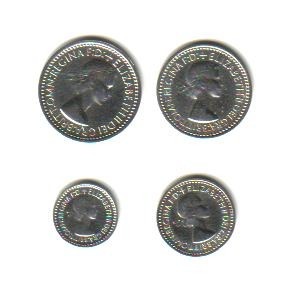 Maundy money however was restored at that time to silver fineness of 0.925 which is still being used today. The obverses of the coinage changed according to the reigning monarch. 1822-1830 Left-facing head of King George IV. All maundy sets of this reign use Pistruccis bust of the monarch. The bust of the 1822 3d is the same size as that on the 2d. The first dies of the 3d broke and there was not enough time to reproduce the die. 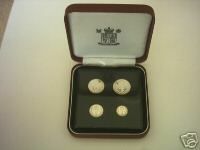 The dies for the Reverse were produced by Jean Baptiste Merlen. 1831-1837 Right-facing head of King William IV. William Wyon engraving for the bust was used. The Reverse was designed by Merlen. 1838 - 1887 Left-facing "Young Head" of Queen Victoria. The obverse was engraved by Wyon and the reverse designed by Merlen. 1888 - 1892 Left-facing "Jubilee Head" of Queen Victoria. The obverse was designed by Joseph Edgar Boehm. The reverse was designed by Merlen. 1893 - 1901 Left-facing "Old Head" of Queen Victoria. The old Head bust was designed by Thomas Brock .Otherwise no other changes in this period. 1902 - 1910 Right-facing head of King Edward VII. The bust was desiged by G.W.DeSailles. 1911 - 1936 Left-facing head of King George V.
Four different types in this reign. Bust designed by Bertram Mackennal. 1937 - 1948 Left-facing head of King George VI. T. Humphrey Pagets bust was used for these coins. 1949 - 1952 Left-facing head of King George VI. 1953 Right-facing head of Queen Elizabeth II. Mary Gillicks design for the bust was used. 1954 Current Right-facing head of Queen Elizabeth II. 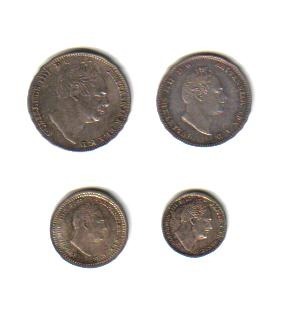 After decimalisation of coinage in Britain in 1971 the maundy coinage values were merely changed to new pence - 1p, 2p, 3p and 4p.